People from area neighborhoods: Allandale, Crestview, Brentwood and Skyview, showed up at Lamar Middle School this afternoon and planted a grove of trees near the corner of Burnet Rd and Koening. 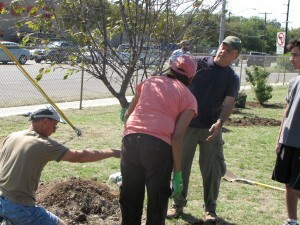 Three live oaks, 2 Mexican plums, and 6 tree yaupons were planted. The tree planting is a Sustainable Neighborhoods initiated project. Jody Jarrett, a licensed landscape architect and member of the Sustainable Neighborhoods steering committee orchestrated today’s planting. He also did much of the advance work to make it a reality including meeting with Lamar school staff, making a site drawing, coming up with an irrigation plan, and arranging for all of the materials. He even got a local nursery to donate two trees. Thanks to Jody, Steve Zettner and Sustainable Neighborhoods for beautifying the corner. Many of us drive through it daily and will appreciate the addition. And thanks to the dozen or so volunteers who came out today with their shovels to plant the trees. It was a lot of hard work.